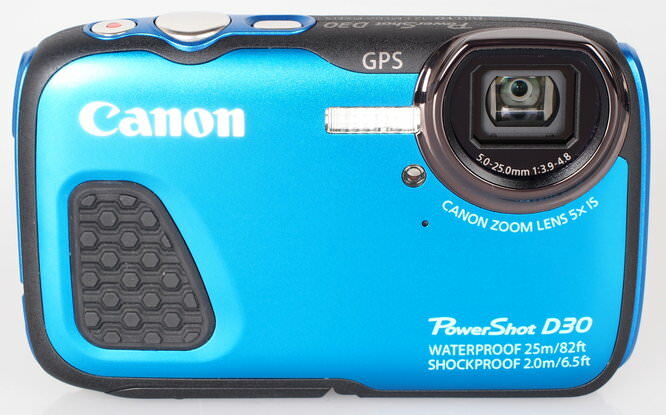 Gary Wolstenholme reviews the Canon Powershot D30 - waterproof down to 25 meters how does this compact camera perform? Waterproof to 25 metres, drop-proof from 2 metres, and freezeproof to -10C, the camera should be able to withstand the trials and tribulations of pretty much anything you can throw at it. The specified waterproof depth should even be suitable for some scuba diving or snorkelling activities without any additional waterproofing. FullHD video is recorded at 24fps and optical zoom is available during recording. 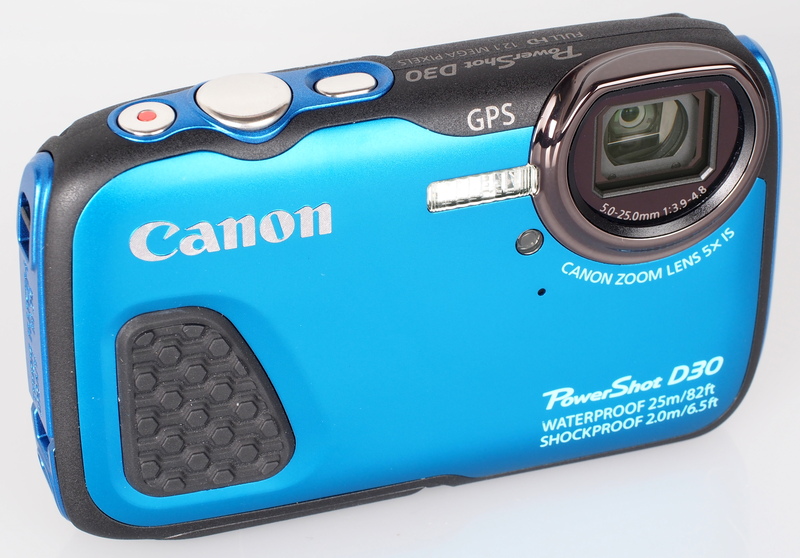 The camera can also record high-speed video at 120 and 240fps, at a reduced resolution. The camera can shoot at 1.9fps at full resolution, which isn't especially fast, especially for a camera of this type. The Canon Powershot D30 feels extremely robust, with heavy duty plastics complimented by a coloured metal face plate and chunky rubberised finger grips that provide a secure grip over the camera body, even underwater. A wrist strap which can easily be tightened for extra security is also provided. Buttons are also quite chunky and well spaced, which should make operating the camera when wearing gloves possible. 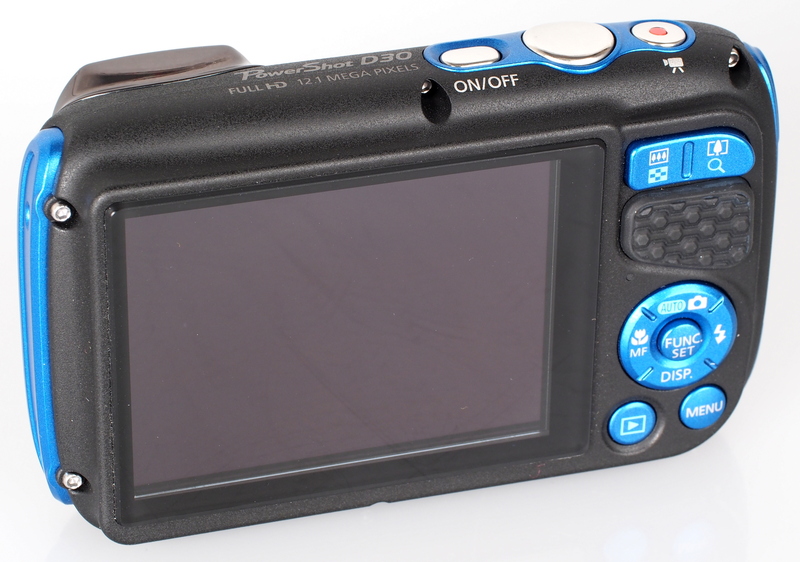 The shutter button on top of the camera is large and surrounded by a recessed power button and a video recording button. The shutter button feels a little spongy to operate, which can make half-pressing it for focus a little more difficult than with other cameras and the position of the video recording button can result in it being pressed accidentally if care isn't taken. Compartments for battery, memory card, USB and HDMI connections are located behind tough locking flaps on the side and base of the camera. The latches that hold these flaps closed can be quite difficult to operate, which can make accessing the memory card, battery or connection quite difficult when out and about, especially if your fingernails aren't long enough to lift the latch. Even so, at least the latches are very secure, which will prevent ingress of dust and moisture when using the camera in challenging conditions. Menus - To change settings you can press the function button, located within the circular 4-way controller on the rear and this will bring up a number of common settings on the screen. To adjust more advanced settings you simply press the menu button and the options are spread over two screens. The menus laid out well, and will feel very familiar those who have used a Canon compact camera before. Battery Life - Battery life is rated at 300 shots according to Canon / CIPA test results with GPS off, which is quite good for a compact camera. 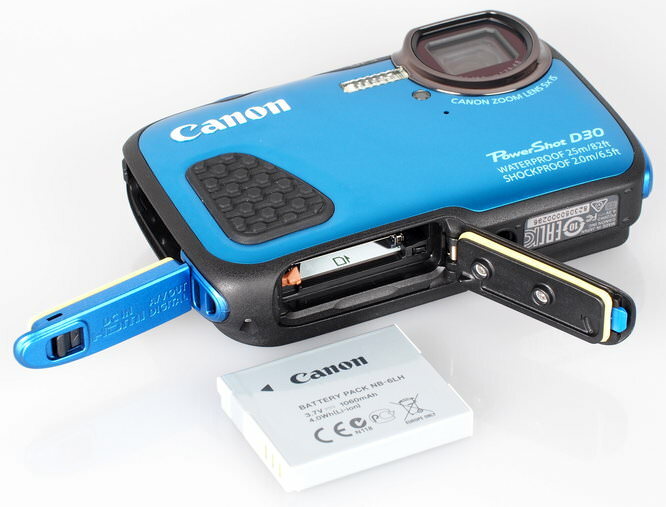 Using GPS will reduce battery life and the battery will last 48 hours of continuous use using only the GPS logger. Shutter response and focus are both excellent, and although the continuous shooting speed is a little disappointing, it will continue to shoot at this speed until you release the shutter button, the battery runs out, or the memory card fills up, whichever comes first, which is impressive. 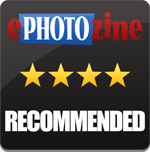 Sample Photos - Images are free of red-eye and colour is good, although skin tones can be a little pink. Images don't have masses of detail in them, especially at ISO settings of ISO400 or greater and on the whole, they could be sharper, which may have an impact on producing larger prints from the images. However, images are fine for sharing on the web via social networking. Lens Performance - The lens isn't the sharpest fitted to a compact camera that we have seen, with images displaying softness across the frame at the telephoto end and soft corners in macro shots. The 1cm macro mode is handy for taking frame filling close up images, although corners can be soft. ISO Noise Performance - Noise is fairly low in between ISO100 and ISO400. Beyond this, noise starts to become apparent in shadow areas of images and the camera's noise reduction system smooths over detail in an attempt to control the noise present. Even so even images taken at ISO3200 should be fine for sharing on the web, although this setting is probably best avoided for producing prints. White Balance Performance - Auto White Balance (AWB) gives a slightly warm cast under tungsten lighting, with the tungsten preset giving more accurate colour. AWB performs well under fluorescent lighting, with their being little to tell between the result using AWB and the fluorescent preset. Digital Filters - There are a number of colour options to choose from in the My Colours section of the function menu. These apply a variety of colour effects to images, such as making one colour more vibrant or applying a sepia tone to images. 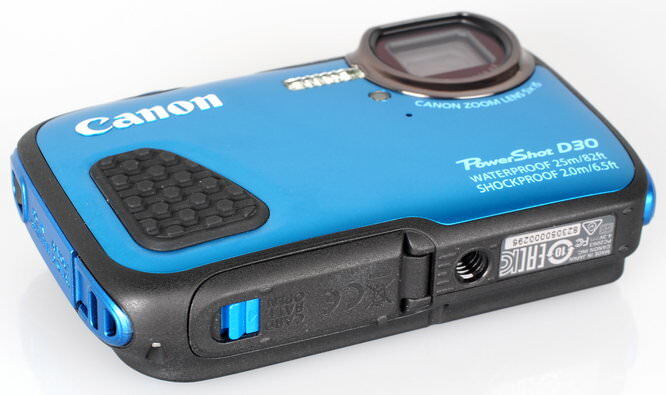 Video - The camera records 1080p video at 24fps with sound, and optical zoom is available during recording. Image stabilisation helps keep the shot fairly steady while recording, although it can take a while to compensate after movement or zoom. Video quality is fairly good, although it would be nice to have higher frame rate options. 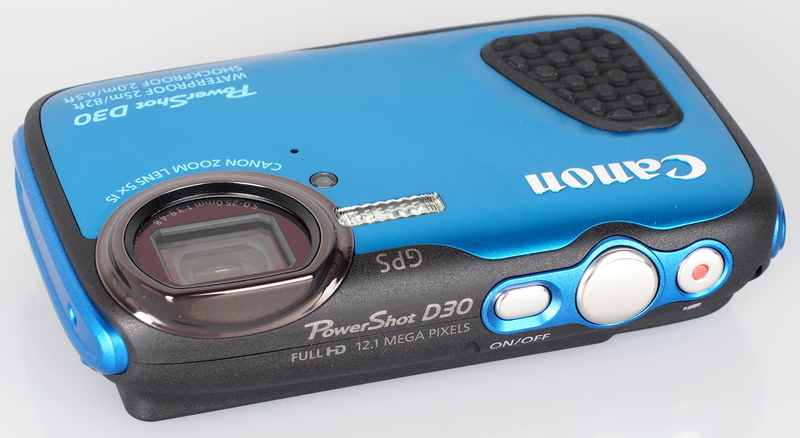 The Canon Powershot D30 is a well specified camera that is built to survive much of the punishment it may encounter during action pursuits. It is well priced and waterproof to a greater depth than much of the competition around the same price, which makes it especially good value for those who enjoy water-based activities, such as snorkelling, caving, canoeing etc. However, images produced by the camera could be sharper and more detailed, and noise could be better controlled for a camera of this price. The Canon Powershot D30 is waterproof to an impressive 25m, far beyond the depths of what the competition has to offer, making it great value for money.